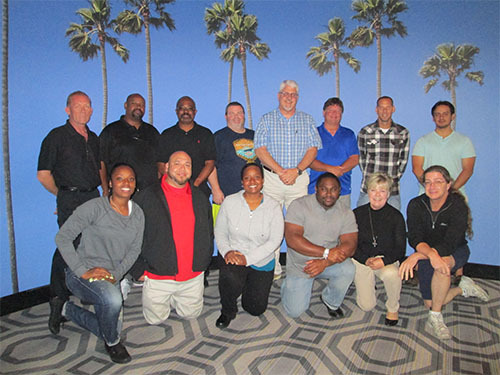 Fourteen new IAM CREST Associate Instructors from Districts 141 and 142 completed a train-the-trainer program on transporting dangerous goods in the airline industry. Approximately 6,300 TCU-IAM airline and railroad workers will receive training in transporting hazardous materials thanks to a nearly $1 million grant from the U.S. Department of Transportation. The grant also includes training for TWU airline workers. The grant is the largest ever for IAM CREST, the Corporation for Reemployment and Safety Training, and will teach 90 members how to train thousands more workers on the hazards of storing, shipping, loading and unloading dangerous goods in the airline and railroad industries. IAM members should contact their Local or District Safety and Health Committees to be considered to become trainers. Since 2008, IAM CREST has been the beneficiary of a DOT Pipeline Hazardous Material Safety Administration grant to provide airline workers with training from IAM CREST instructors. In 2014, the grant was expanded to include railroad workers. The latest grant supports existing training through employers not in duplication of those efforts. Visit the IAM’s Pipeline Hazardous Material Worker Training website for more information.